Mr. Griffin has extensive industry experience including working with Marriott as a Sous Chef at the Renaissance Grand and Suites Hotel in St. Louis, MO, and the Marriott Washingtonian Center in Gaithersburg, MD. Executive Chef and Assistant General Manager with Franklins’ Restaurant and Brewery in Hyattsville, MD. Mr. Griffin is a Certified Food and Beverage Manager from the American Hotel and Lodging Association and a Certified Dietary Manager | Certified Food Protection Professional from the Association of Nutrition and Foodservice Professionals. 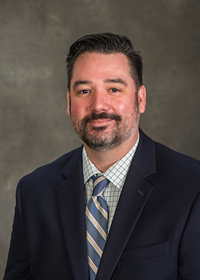 Mr. Griffin’s teaching experience includes Associate Professor of Hospitality Management at St. Louis Community College (2012-2017) and Assistant Professor of Culinary Arts/Director of Foodservice at Kaskaskia College (2007-2012).